Dr. Maeda has been with Syntrix for over 10 years, and is inventor on all company IO patents. Dr. Maeda has acted as lead medicinal chemist on a number of drug development projects. During his tenure, Dr. Maeda fostered key collaborations with prominent scientists in academia and industry to further preclinical development milestones. Dr. Maeda is the Principal Investigator on a multi-year SBIR grants from the National Heart, Lung and Blood Institute (NHLBI), which has led to the identification and preclinical advancement of SX-682. Dr. Maeda was also responsible for the optimization of processes utilized in the synthesis of Phase II candidate, LD-aminopterin. 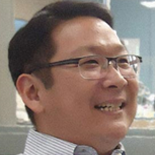 Dr. Maeda continues to lead discovery and preclinical lead optimization efforts at the bench, and he has over 20+ years of hands-on chemical research experience. As a supporter for chemical education, Dr. Maeda also closely oversees the Syntrix internship program, instructing select college students in the chemistry behind small molecule drug development. Dr. Maeda was an invited speaker at the 2013 NHLBI Regional Innovation Conference held in San Francisco.